I'll be out in Ohio Wednesday Thursday Friday and Sunday . PA on the other days. 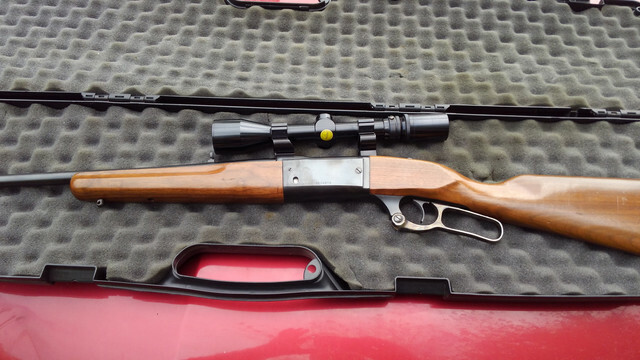 Carrying a Savage 99 in .375 Winchester. I do hunt Grand River . Have pretty much lost all of my private land in this area due to leases. Can't blame the farmers, they gotta make money. same here jake . starting to loose my private land but only to the passing of the farmer & then when the kids get it in their control bam they sell it to realator's . used to have a dozen farms to hunt on right now it's down to 3 & after this year it may only be 1 farm & it's 50 acres. how many guys can hunt on this & be comfomtable? maybe 3 at the extreme most. one of the farms i hunt on i'm kinda the care taker , i cut trees's& vines in the spring.he's 75 yrs young & still works as for a living. owns his own trucking co. but lease's farm to another farmer. Last edited by t.shaffer; 11-20-2018 at 07:16 PM. It's crazy how quickly it's all changed here. ​​​​​​I used to have farmers pass my number around and their friends would call me, because they knew I'd come out and shoot does. Allot of hunters wanted to hunt all year after big bucks but wouldn't impact the doe population. So they'd let me come out to tag out on doe. But not anymore. The leases have ended all of that. well i just recieved a phone call from a farmer who want's me to come out to hunt deer & yotes use to hunt there but i quit going there due to slob hunters & now he said that he has not renewed there permission. going out today in the afternoon to chat with him & get a permission slip signed . I've always said if you treat people and their property with respect and help out when you're able, you'll have no trouble finding places to hunt. That seems to not be holding true for me lately. But still a good rule to live by. I don't mind hunting public land, I primarily still hunt anyway and it is nice to have a large chunk of land to do that. Hope this new property works out for you! What county is it in? tom, like jake has said, hunting around here is just as bad as Ohio. too many leases and posted ground. we used to hunt all the ground from the Avonmore bridge to Maysville, but not anymore. everything from Saltsburg to Clarksburg is posted too. it really ticked me off when the girl scouts got the land and used money from the united way to buy it. then posted it tight.